The area surrounding Moscow has many historic towns anchored by ancient monasteries, but few have a more peculiar history than the St. Nicholas-Ugreshsky Monastery, located in the town of Dzerzhinsky just to the south of Moscow. The St. Nicholas-Ugreshsky Monastery was founded by Grand Prince Dmitry Donskoi in 1380. According to legend, an icon of St. Nicholas miraculously appeared to the famous prince in a tree near a meadow where he and his troops had stopped to rest on their way south to confront a Tatar army. The army went on to win an epochal battle over Khan Mamai at Kulikovo Pole near that would forever mark Russian history. Interpreting the appearance of the icon as a good omen, Prince Dmitry ordered the establishment of a monastery at the site. According to a medieval narrative, the miraculous icon warmed (“ugreshe”) the heart of Prince Dmitry, thus giving rise to the popular designation of the monastery. Situated near the court village of Ostrov, the location was already well known to Moscow’s princely elite, and the new monastery rapidly rose in status. By the 15th century it had its own legation in the Kremlin. Like other Moscow monasteries, St. Nicholas-Ugreshsky shared the city’s turbulent fate. Built of wood in its early centuries, the monastery was burned to the ground in 1521 during a major attack on Muscovy by the Crimean Tatar khan Mehmed I Giray (1465-1523). Reconstructed shortly thereafter, the monastery gained its first masonry church with the building of the new Cathedral of St. Nicholas, presumably in the 1520s or 1530s. Frequently renovated, parts of the structure were rebuilt in the 1840s. In 1940, the cathedral was razed. As part of the revival of the monastery after 1990, the cathedral was rebuilt in a stylized form suggestive of 15th-century Muscovite architecture. Throughout the 17th century, the St. Nicholas-Ugreshsky Monastery was a frequent pilgrimage site for the tsar and his courtiers. The young tsar Peter I was a frequent visitor in the late 1680s, and in 1698 the monastery was a place of detention and interrogation for the musketeers (streltsy) involved in the infamous revolt against Peter’s authority. With the secularization of Russian society and politics in the 18th century, the influence of monasteries waned, as did financial support. Buffeted by these general trends, the St. Nicholas-Ugreshsky Monastery had specific problems in administrative and spiritual life. With inadequate resources, the monastery was increasingly used to hold social outcasts, indigents and the sick. In 1771 it was quarantined to hold victims of the plague that devastated Moscow. During this grim period, a few steps were taken to maintain the monastery. The St. Nicholas Cathedral was repaired, and in 1758, construction began on a large bell tower, completed in its original form of three levels around 1778. In the fall of 1812 the monastery was briefly occupied by French troops. By the early 1830s, the monastery had decreased in importance and the church considered closing it. At this point, the plight of the St. Nicholas-Ugreshsky Monastery came to the attention of two of Russia’s most prominent prelates, Archimandrite Ignaty Brianchaninov and Metropolitan Philaret (Drozdov). Through their intervention and with the generous support of a merchant dynasty led by Peter Alexandrov, the monastery experienced a vigorous revival, symbolized by the renovation of the St. Nicholas Cathedral in the early 1840s. Of special importance to this resurgence was the energetic guidance of Archimandite Pimen Ugreshsky (Petr Myasnikov; 1810-1880), who took monastic vows in 1838 and was entrusted with leadership of the monastery by Metropolitan Philaret in 1852. During the latter half of the 19th century, the greatly enlarged monastic territory was redesigned to a concept inspired by Fedor Solntsev, an artist and archeologist who had a substantial impact on the reinterpretation of Russia’s architectural heritage. As is often the case with Russian monasteries, the most visible element of the new ensemble was its bell tower. With a firm base provided by the original 18th-century structure, the tower gained four additional levels in 1859 that brought its height to over 295 feet. During the Soviet period, the upper tiers were demolished, but the tower has now been restored to its previous height. The 19th-century building campaign culminated with the construction of the grandiose Cathedral of the Transfiguration, begun in 1880 and completed in 1894. 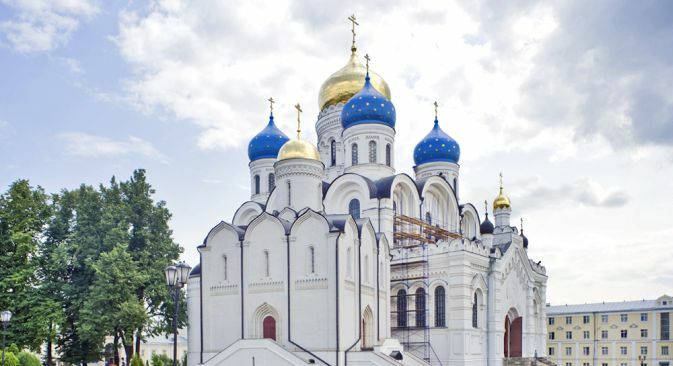 Designed in what is known as the “pseudo-Russian” style by the architects Alexander Kaminsky and Boris Freidenberg, the Transfiguration Cathedral remains one of the largest churches in the Moscow region. The icons in the new icon screen were painted by masters from the traditional artistic center of Palekh. The most unusual element of Solntsev’s architectural vision for St. Nicholas-Ugreshsky Monastery occurred with the rebuilding in 1866 of the north wall, which faced the main road to the monastery. Known as the Palestine (or Jerusalem) Wall, this idiosyncratic structure, with its panoply of towers and intersecting visual lines, was meant to suggest the image of the Holy City of Jerusalem as represented in traditional Russian iconography, particularly in the background Crucifixion scenes. Following the Russian revolution and the establishment of the atheistic Soviet state, the monastery briefly existed as a commune, then was closed in 1925. Monastery buildings were converted to use as a colony for children abandoned during the upheaval of the civil war years. The project was of special interest to Felix Dzerzhinsky, head of the Soviet secret police, and after his death in 1926, the newly formed town was given his name. Returned to the Orthodox Church in 1991, St. Nicholas-Ugreshsky Monastery began a prolonged process of revival that has led to its current vibrant state. Its educational mission has expanded to include an Orthodox seminary, formed in 2000. A number of churches and chapels have been restored or entirely rebuilt, with much of the ensemble grouped around a picturesque pond. With its carefully landscaped setting, the monastery provides a spiritual as well as physical oasis to visitors.